“This grant gives our students an exciting opportunity to get real world research experience. This experience will not only help students support themselves financially, but it will also give them a unique relationship with faculty in a lab setting. Students will quickly learn if a biomedical career is for them,” said Carol Scherczinger, dean of arts and sciences at Rowan-Cabarrus Community College. 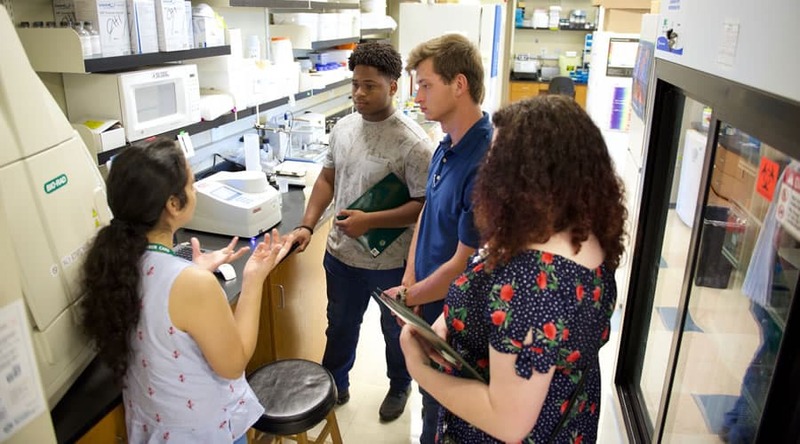 The regional project is expected to contribute to the nationwide conversation around the issue of what helps—or hinders—community college students as they strive for careers in STEM fields, particularly in the life sciences. Each year, UNC Charlotte welcomes more community college transfers than any other North Carolina college or university. Collaborators at each institution include faculty from diverse disciplines, as well as institutional leadership. At UNC Charlotte partners include the College of Liberal Arts & Sciences, the College of Health and Human Services, J. Murrey Atkins Library and the University Transfer Center, which is a resource for transfer students. Faculty participants and lab resources also come from other colleges, including the Lee College of Engineering and the College of Computing and Informatics.